Press Release: FH Sponsors Climate Change Event "Earthkeeping"
In our global work for sustainable development, Food for the Hungry (FH) Canada has witnessed firsthand the devastating effects of climate change on the most vulnerable. As a result, disaster risk reduction has become one of the four pillars of our development programming, and we share environmental best practices with our partner communities every opportunity we get. FH Canada is, therefore, proud to announce that we are sponsoring Earthkeeping: A Climate for Change featuring renowned climate change expert, Dr. Katharine Hayhoe. Researcher. Climate scientist. Christian. In these few words, Dr. Katharine Hayhoe seems to defy the stereotypical images that are so often thrust onto either camp in the climate change debate. So much so, that she was named one of Time Magazine’s 100 Most Influential People and featured in Showtime’s Emmy award-winning series, Years of Living Dangerously. 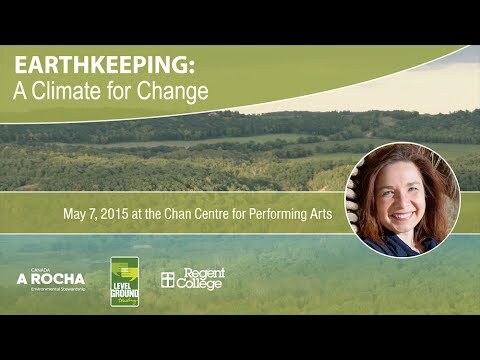 On May 7, Dr. Hayhoe will be in Vancouver for one night only to share her experiences and distinct perspective at Earthkeeping: A Climate for Change, presented by A Rocha Canada and Regent College. The event, set at the Chan Centre for Performing Arts in Vancouver, will be a unique opportunity to hear from one of the world’s leading atmospheric scientists on both her research, and her faith. Vancouverites have played a significant role in Canada’s climate conversation, and we know they will thoroughly enjoy this event. Attendees will be offered an intimate conversation with not only an excellent lecturer, but an internationally recognized advocate for how climate science and faith can work together. - Jeffrey Greenman, President of Regent College. Tickets: Tickets start at $20. Special guests at the event will include Peter and Miranda Harris, founders of A Rocha International and musical guests Sheree Plett and Jeremy Eisenhauer. A Rocha is an international Christian organization which engages in scientific research, environmental education, community-based conservation projects and sustainable agriculture. Based in the lower Fraser Valley, A Rocha has hosted and trained hundreds of students, scientists, and those interested in conservation from around the world. Founded in 1968, Regent College was the first graduate school of theology in North America to make the education of the laity its central focus. Its Christ-centred programs and courses bring together vibrant, evangelical faith and rigorous academics. Food for the Hungry: Press Release: FH Sponsors Climate Change Event "Earthkeeping"